At the time, it has to be said, I didn't enjoy myself too much - but it was fascinating to just watch. Early evening as the ship started to pitch and roll I remember picking up lots of stuff from the lab deck. It wasn’t long before we three gave up trying to work, and went up onto the bridge to just watch the storm in silence. It's odd thing at night on the bridge of ship watching a big storm. For one thing it is pretty quiet with the only noise being the air conditioning, the sound of the window wipers, and the occasional drum roll of water hitting the bridge window. As the night wore on more scientists came up to the bridge. They couldn’t sleep. Eventually the Captain came up. 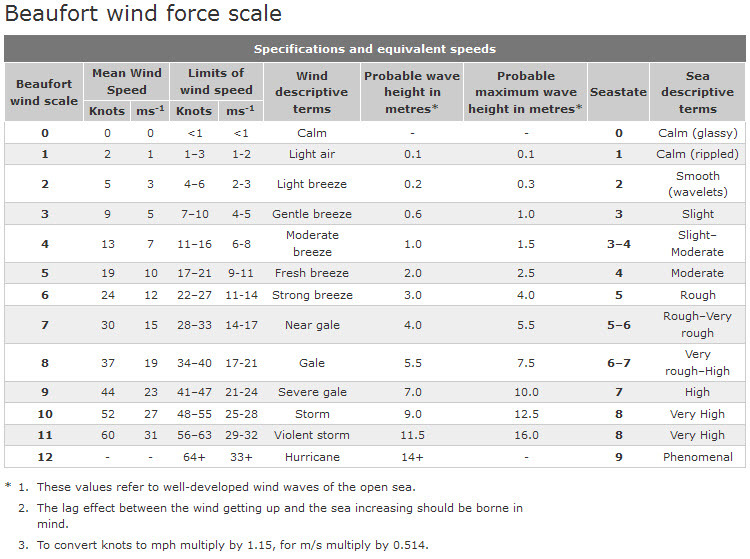 Here is the air temperature and the true wind speed when the storm passed us for the 2 day period 4 to 6 April 2007. The Air temperature and wind speed during the storm. In the top panel you can see straight away that it wasn’t actually that cold, -2°C to +2°C, that's alright isn’t it? The bottom panel tells the story though. The blue line is the true wind speed and the red line is the data in the blue plot with a 10 minute smoothing filter applied. Doing that means one can get an impression of how gusty the wind was. If you look at wind scale on the bottom plot you can see that the wind rises from around zero, to ~30ms-1 with the 10 minute smoothing, and the blue line shows that it was gusting to more than 40 ms-1. Winds of 30 ms-1 gusting to 40 ms-1. From the table, and the wind speed picture you can see that it blew up from a Beaufort 0 to a Beaufort 12 in 24 hours, and then in a further 6 hours it had dropped to a Beaufort 6. As the third officer of the ship Doug was working the 2000-0000, and 0800-1200 shifts I can guess when the video was taken. My axis is Greenwich mean time (GMT) which is local time+4 hours. Doug didn’t record it on the evening watch because it was dark and completely pitch black - so it is the morning watch and on the bottom axes in the plot above it that would be from 0400-0800 (the bit I have shaded grey above). Doug recorded the clip probably close to where the wind was a maximum, but the waves on the sea were still growing. To be honest it was a bit scary. The RRS James Clark Ross is a well found ship, but watching the huge mass of water coming over the bow was humbling. In some ways it was quite relaxing - but what would have happened if one of the bridge windows smashed? That happened to the cruise ships Caledonian Star and the Bremen not too far from where this film was taken. Imagine what tons of cold salty water violently thrown over the electrical controls of a ship would do. The Bremen ended up adrift for a couple of hours with no power and the Caledonian Star was escorted back to port by a warship. Scary stuff in conditions like that. You can see that the storm didn’t last that long as it whizzed past us - probably just 24 hours of being really grim. This sort of thing makes me think of how must have been for sailors and explorers in the past. If you were on a sailing ship you would have to get up the mast and get the sails down - or lose the mast as the wind increased. 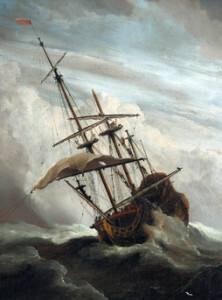 Lose the mast, then maybe lose the ship. Now we are shielded from the weather it's hard to imagine that ships had an open bridge until relatively recently. My dad was British Merchant Navy and he on sailed on ships like that. Salty tea anyone? 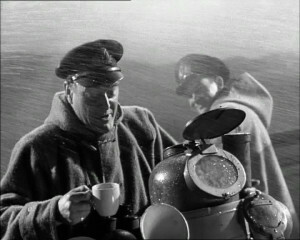 A screen capture from the 1953 film The Cruel Sea. I said the 3rd officer was Callum, I was wrong. It was Doug! Callum was the second officer, Robert the Chief Officer and Graham the Master. So we that know that my memory - which is so vivid of the storm - is going. Entry changed to Doug, and apologies to both Doug and Callum. And thanks to Simon Wright (Officer on the James Clark Ross), and Dr Geli Renner for the correction.